As mentioned previously, I spent this weekend back at my parents’ old house in Halton, where I grew up. I had returned with my mom with the intention of visiting with my dad (who is minding the house until it sells), and collecting a few plant specimens from my mom’s garden. She has put a lot of time and effort into it over the years, and it has become a beautiful perennial garden. Her focus over the last decade or so started to shift toward daylilies, so there are well over 100 varieties in the garden that produce a fabulous riot of colour in the summer. Mixed in with all these, however, are quite a number of other perennials, some of which I coveted. Oh, sure, I could just go down to our local nursery and pick up a few cartons of the species I had in mind. But taking divisions from some of the plants in my mom’s garden has a whole lot more sentimental value. I did end up with all of my target plants, with the exception of the goatsbeard, which proved resistant to our efforts to chop into the roots to divide it. I was a bit disappointed about that, given the profusion of insects attracted to its blooms in the summer, but still quite happy with my other plants. But the header image is obviously not a plant. 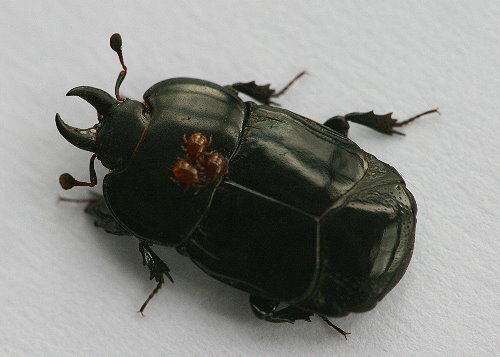 It’s a beetle, a member of the family Histeridae, the Clown Beetles. Many of these beetles are interesting shapes and colours, which gives the family their name. In the case of this guy, Hololepta aequalis, he was extremely flat (the Kaufman guide describes it as “paper-thin”). 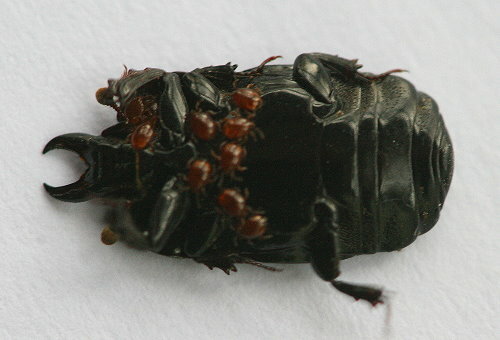 Both the adults and larvae of this family are predatory, preying primarily on other insects such as grubs and maggots. Only a few species in the family are dorso-ventrally flattened like this one. These species typically live in newly-dead hardwoods, between the outer bark layer and the inner wood layer, before the bark has loosened much and started peeling off. Obviously there is great advantage to a flatter profile for this habitat niche. I found this guy, not on a log, but crawling across my shoulder. I felt a tickle on the exposed skin about my neck, and brushed him off in reflex. I actually hadn’t dug any plants yet, so I’m not sure at what point I picked him up. Possibly when poking around the forest I’d brushed against something and knocked him off. I took my photos and then released him outside again. I noticed, when I looked closer, that he had a bunch of mites crawling across his shoulders and belly. Quite a few mites; ordinarily, when I see them, there’s only a few on any given host individual. 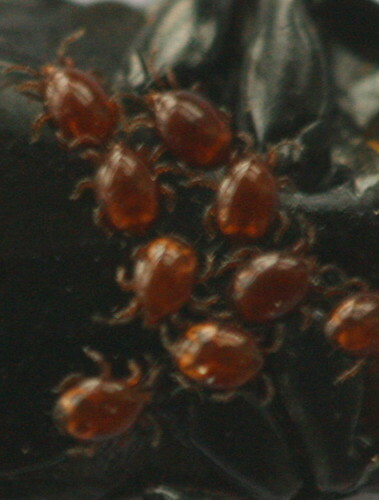 I’m not sure of the identity of the mites; I didn’t get very clear photos (the light was poor and the beetle active, making for a lot of blurry pictures), and they can be hard to identify at the best of times. So I’m not sure about their purpose hitching a ride on the beetle. I’ve read a few things that suggest they may not be parasitic (ie sucking blood), but rather are just along for the ride. But it will probably remain a mystery. That’s a top find. I wonder if those mites cause any distress or irritation to the beetle? It must be annoying, at the very least, to carry around such a large bunch of freeloaders. And it’s not as if they’re particularly small in relation to the beetle. I imagine it must be quite wearying to carry around so many mites even if they aren’t parasitic. One would think that, relative to the size of the beetle, the mites would constitute quite a bit of extra weight to be carrying around, but he seemed not to notice. I would think it wouldn’t be too hard for him to brush off if he really didn’t want them there. Maybe the mites help keep him clean, like oxpeckers riding around on water buffalo. 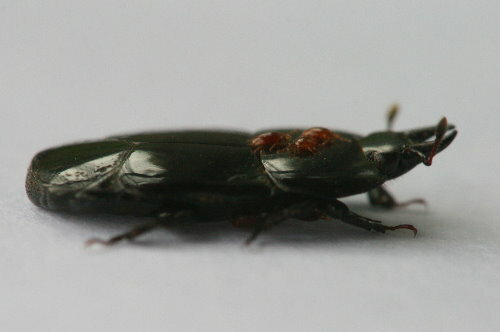 Virtually all of the photos of the species on BugGuide.net show them with mites, which sort of suggests some sort of symbiotic relationship. Just found one of these on my kids plastic play house which is next to a compost bin. I live just outside San Antonio, Texas, and it took a lot of google searching to figure out what it was. Like yours, it also had several mites on it. I wonder what trees they prefer around here, as most of ours are mesquite or live oak.